Depth of Cut at 45 Deg. 1-15/16"
Depth of Cut at 90 Deg. 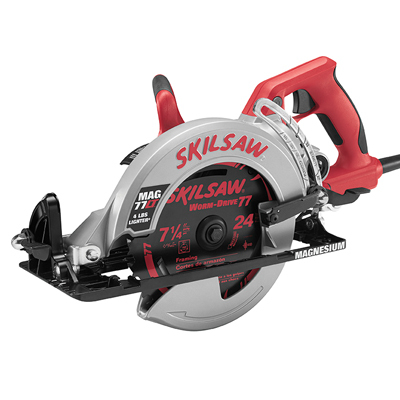 2-3/8"
The MAG77LT magnesium worm drive SKILSAW® continues the long tradition of quality, rugged durability and consistently exceptional cutting performance. The MAG77LT weighs in at 11.5 lbs., 4 lbs. less than the original SHD77, making it the lightest worm drive saw on the market. New features have also been added to make this the world's best cutting tool.